Balboa Bikes 'N" Beach Stuff, 601 E. Balboa Blvd., Newport Beach. Seeing this old building in Balboa with the “Green Fence of Death” around it set off all kinds of alarm bells for me. However, it seems the front portion of the building is being saved even though the back portion is being rebuilt with additional stories added. It’s not ideal, but it beats total demolition by a bunch. 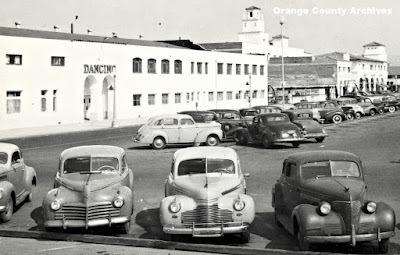 The building was constructed around 1929 as the latest incarnation of a popular Balboa café owned by Gus Tamplis (a.k.a. G.B. Temple). Tamplis was born Kostantinos Basilion Tempelis in the small village of Kastria, Greece in the early 1890s and came to America around 1907. When he was naturalized in 1918, he legally changed his name to Gus Basilion Templis. It was under this name that he soon enlisted in the U.S. Navy. He served as a ship's cook during World War I and was honorably discharged in late 1921. 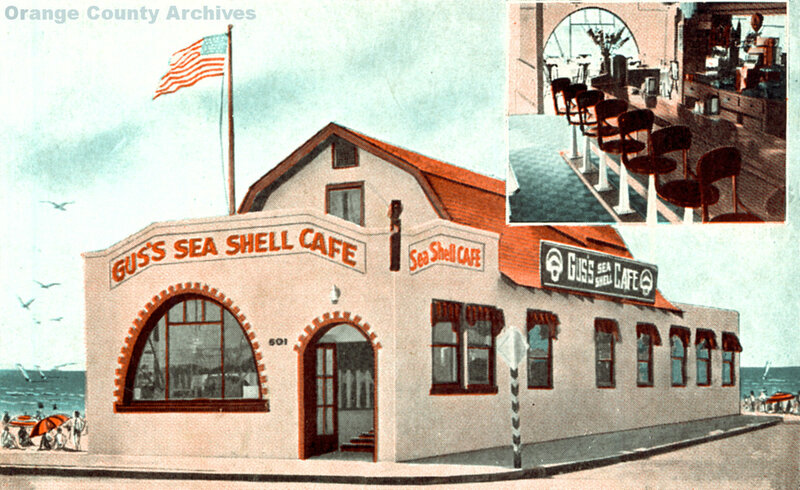 In 1922, Tamplis opened “Gus and Tony’s The Sea Shell” near the Balboa Pier at 105 Main Street. The café specialized in Mexican (“Spanish”) and Italian fare and rapidly gained a large following. By 1923 it was known simply as Gus’ Sea Shell Lunch. 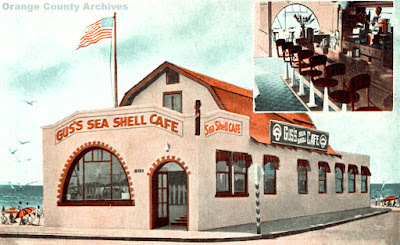 By 1924, it was called the Sea Shell Café, and had moved to a somewhat larger space next door at 107 Main. According to the L.A. Times’ (Celebrate!, Vol. 2 historical supplement, Oct. 16, 1988), "…Everybody called him Gus Gus... He spoke with a thick accent,… and usually he only answered direct questions with a 'Yes Yes’ or a 'No No.’ Hence 'Gus Gus.'" In 1929, Gus Gus moved again to a new location at the Corner of Palm Street and Central Ave. This move was a wise and calculated decision. This put the café directly across the alley from the new and wildly popular Rendezvous Ballroom. The Ballroom played host to some of the biggest musical acts in the country, as well as providing a home for new talent on the way up. By the late 1930s, the Sea Shell café (now serving mostly seafood and) and bar was well-established as was the place where the ballroom crowd congregated. During World War II, Gus' cafe was also often the meeting place for the local USO executive committee. It also was the site of the first meeting of the Newport Harbor chapter of the Kiwanis Club in early 1941. By 1952, Gus was living on Balboa Island and still owned a café somewhere, but it didn’t seem to be called the Sea Shell, and it definitely wasn’t at the corner of Palm and Central (by now called Balboa Blvd) anymore. The building at that location was now selling bamboo and rattan gifts. 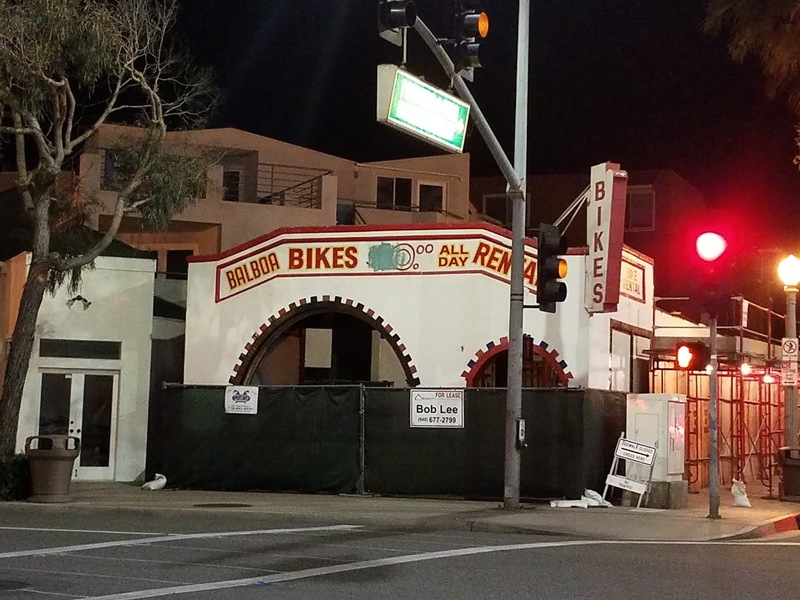 Later it would become a bicycle rental shop. Gus Gus died Aug. 22, 1954 and is buried at Fairhaven Memorial Park in Santa Ana. As for the fate of the old café building,... well,... Keep an eye on that corner!